According to the Department of Health, "in 2009, there were 755 new cases of HIV/AIDS and 16,721 persons are living with HIV/AIDS in the District of Columbia or 3.2% of all District residents." African Americans make up a disproportionate number of people living with HIV/AIDS. KNOW YOUR STATUS - get tested at one of the testing sites below for free. USE PROTECTION - while condoms aren't 100% protection against HIV/AIDS, STDS or pregnancy, there are way too many of you going raw dog (without any protection). Strap up and protect yourselves. Call (202) 383-9192 for more information. 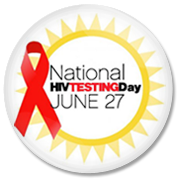 Free HIV Testing; Max Robinson Center; 2301 Martin Luther King, Jr., Ave.